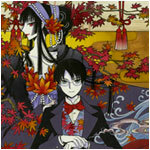 The second volume of XXXHOLiC Rei will be released on April 23rd, says Kodansha. Like volume 1, this volume will have a limited edition that will come with the original animations of XXXHOLiC Rou (2010) and XXXHOLiC Rou ~Adayume~ (2011) in Blu-ray format. CLAMP will draw the Blu-ray jacket illustration and a XXXHOLiC-themed memo paper sheet will come as a bonus. (not sure if the image above is from the cover of volume 2 or the Blu-ray jacket… probably the former). I have heard but it looks to be joining the other titles on indefinite hiatus at this rate. It’s a shame really as I think XXXholic has gone on for too long.